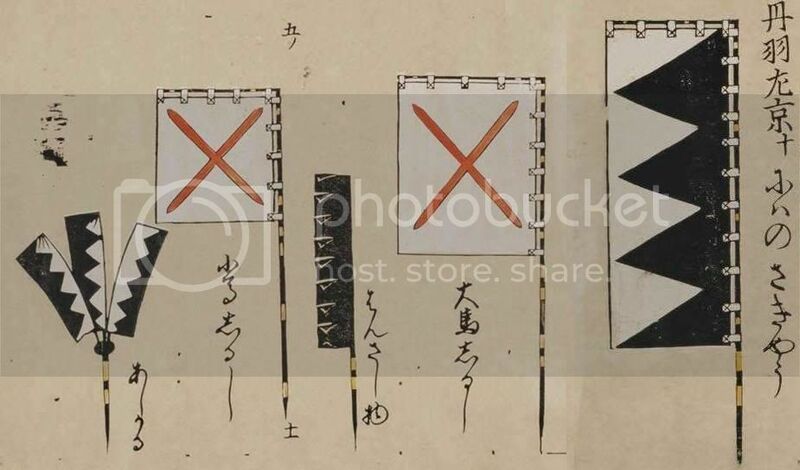 The progression of change in the Matsuura banners is well illustrated elsewhere, by the time of Takanobu a red fukinuki had replaced the 3D 'three star' O uma-jirushi, and a simpler 3D 'three star' standard had replaced the 'Mackerel's tail' Ko uma-jirushi. 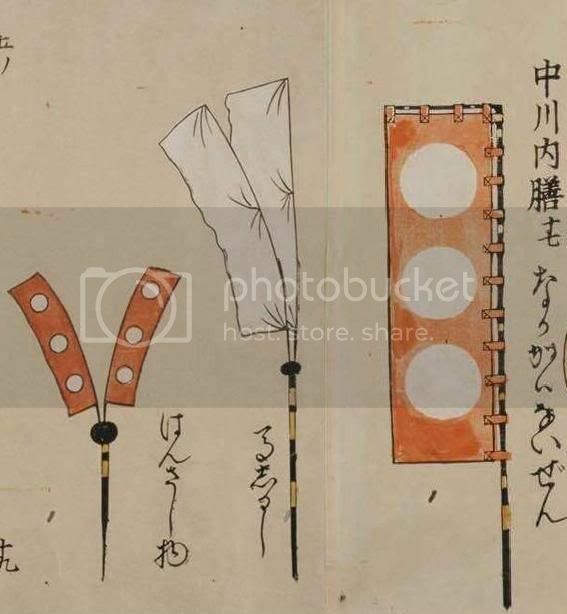 The predominant colour was red, but a blue version of the sashimono exists, suggesting that samurai units may have displayed sashimono using the five lucky colours. Takanobu became Daimyô of the Hirado-han 1603 - 1637 (Hizen 63 200 koku) when his father, Hisanobu, died after only 1 year as Daimyô. The family had supported the losing side at Sekigahara but appeased Tokugawa Ieyasu by burning down their own castle, a new one was built during the Edo period. Nobunao was the eldest son of Mizoguchi Nobukatsu and the grandson of Hidekatsu. He followed his father as Daimyo of Shibata, Echigo which he held 1628 - 1672. he was followed by his son Shigekatsu. The fief remained in the family till 1871. 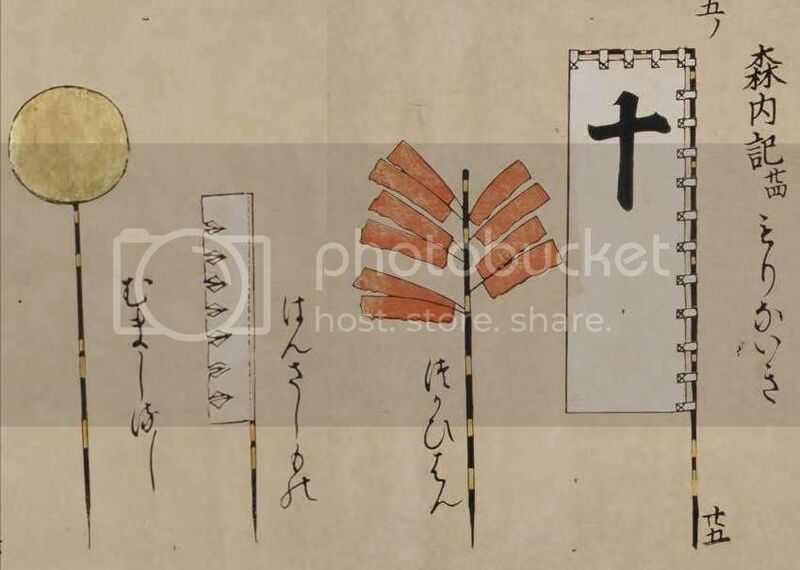 The banners are very similar to 101 Mizoguchi Hidekatsu, with a slight difference in the roundels and number of black/white stripes on some banners. I may have attributed this cross-purposes between the two Mizoguchi, any comments welcome. 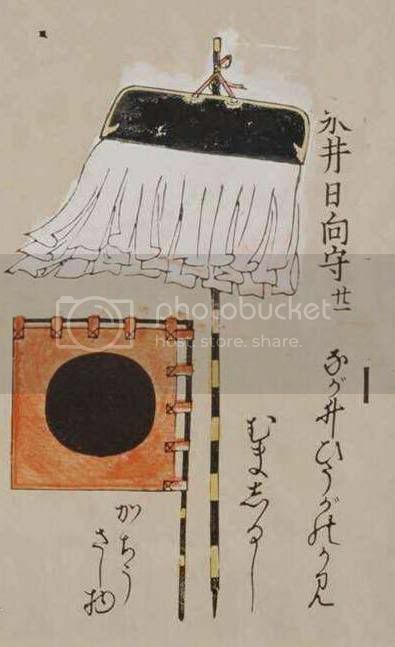 My one other illustration on file shows the disc in a ring as Nobunao. Katsunari (Katsushige) was the son of Mizuno Tadashige. He served under Sasa Norimasa during the Kyushu campaign and during the Imjin war served under both Katô KIyomasa and Konishi Yukinaga. He later served the Tokugawa at Ôsaka and Shimabara. Originally holding Kariya, Mikawa 30 000 1600 - 1615, then Koriyama, Yamato 60 000 koku 1615 - 1619 he was later moved to Fukuyama, Bingo 100 000 koku 1619 - 1639. He was followed by his adopted son Katsutoshi. Katsutoshi was the son of Mizunoya Masamura. He received Shimodate, Hitachi 32 000 koku in 1598 and held it till his death in 1606. His son Katsutaka held Shimodate then Nariwa and finally Bitchu Matsuyama, however by 1693 the family were no longer Daimyo. The eldest son of Môri Motokiyo. He led a Western force against Annotsu Castle in the early stages of the Sekigahara campaign, and at the battle had 15 000 men on Mount Nangû, but as his relative Kikkawa Hiroie, to his front, would not move they took no part in the battle. After the battle he became Daimyo of the Chofu fief in Nagato 60 000 koku, which he held 1600 - 1650. The fief had been drastically reduced in size and income from his father's tenure, pre-Sekigahara. The 6th son of Mori Yoshinari and younger brother of Mori Nagayoshi who he succeeded as head of the Matsuhiro-han 1600 - 1603 (Shinano 137 500 koku). In 1603 he received Tsuyama-han (Mimasaka 185 000 koku). He held this till 1634, he was responsible for the development of the castle town and the internal politics of the han. He was followed by his adoptedd heir Mori Nagatsugu (1610 - 1698) - the son of Seki Naritsugu. Takamasa, the son of Môri Takatsugu (1528 - 1597, was a Toyotomi retainer from Ômi, and was not related to the more famous Môri. He served during the Imjin war. Afterwards he received Saeki in Bungo (60 000 koku). Backing the wrong side for the Sekigahara campaign his income was reduced to 20 000 koku. He held the fief till 1628, and was followed by his son Takanari. Although Takanari only held the han till his death in 1632, the han remained in the family till 1871. The son of Nabeshima Naoshige, he was born at their Saga Castle in Hizen. 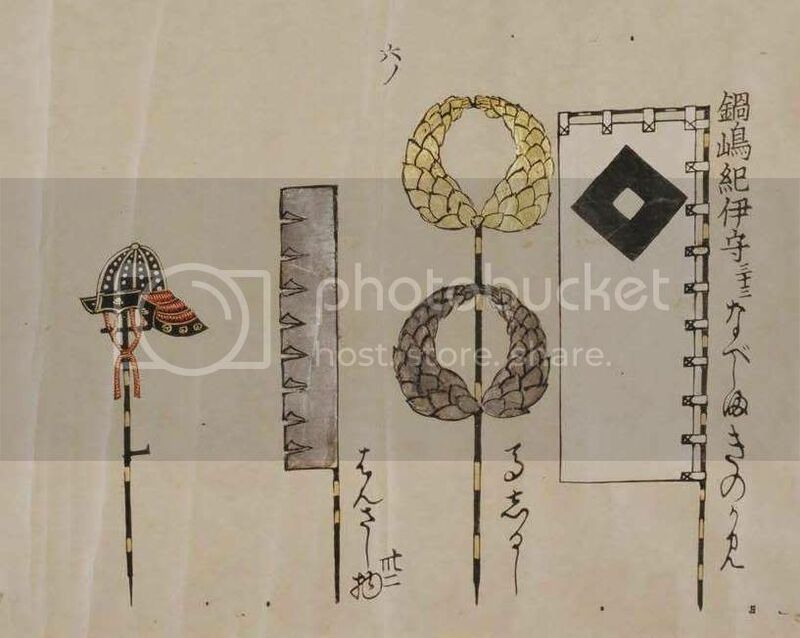 Sent by his father to support Tokugawa Ieyasu for the Sekigahara campaign he was almost convincved to join the Ishida instead, so his father recalled him and prevented what would have been a costly mistake. The army went to fight the Tachibana instead. During the Ôsaka campaign they remained in Kyushu watching the Shimazu. He later served the Tokugawa in putting down the Shimabara rebellion. He ruled the 375 000 koku Saga-han from 1607 till 1657 and was succeeded by Nabeshima Mitsushige, his grandson. 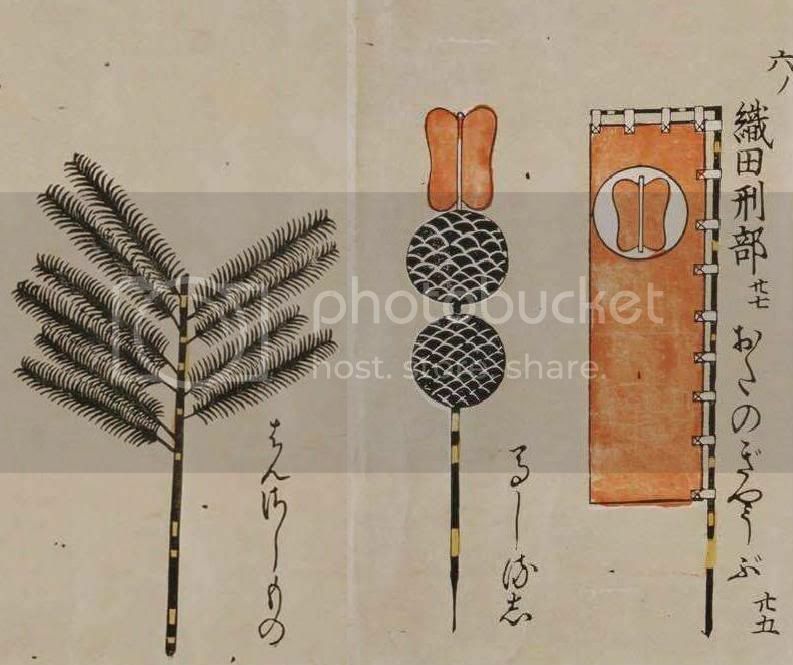 During his time he set two mini domains for some of his sons (Naozumi – Hasunoike-han 52 000 koku and Motoshige – Ogi-han 73 000 koku) all who eventually became Daimyô. In addition, his brother, Tadashige, held a small sub domain at Kashima 25 000 which also became a han and he a Daimyô. 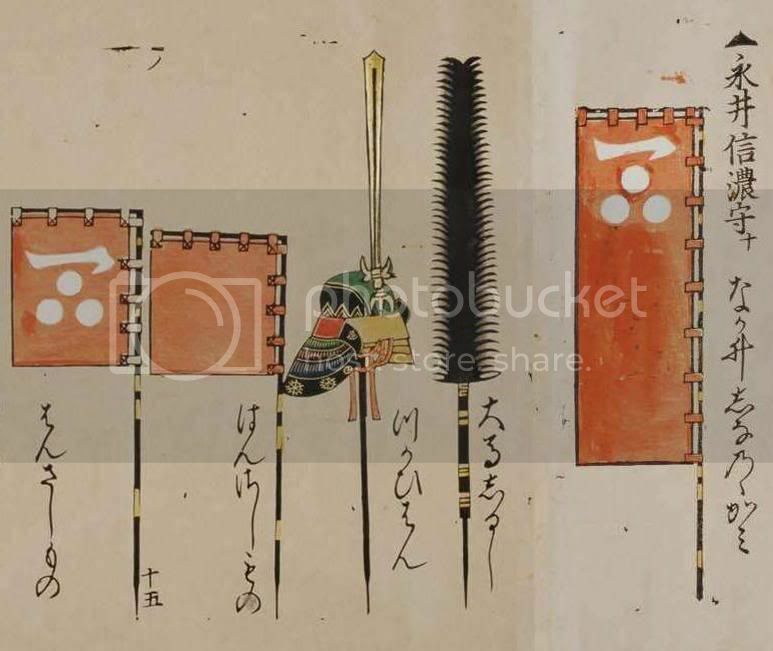 The eldest son of Nabeshima Katsushige and present with their army during the suppression of the Shimabara rebellion. He held Ogi Domain which was originally a sub-domain of the Saga Domain, founded in 1642 for him. 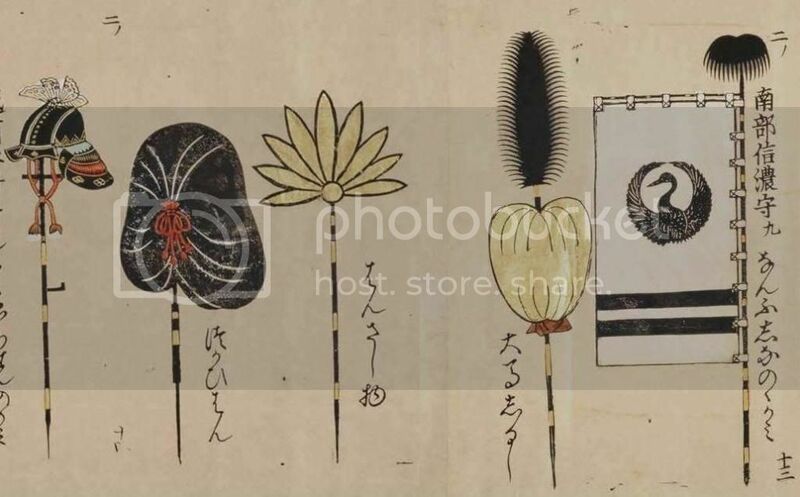 Although Motoshige was the eldest son, he was displaced in the line of succession for Saga Domain by his younger half-brother, Nabeshima Tadanao, whose mother was a daughter of Shōgun Tokugawa Ieyasu. Motoshige was assigned holdings of 73 000 koku, and also served as an advisor to Shōgun Tokugawa Iemitsu. His son Nabeshima Naoyoshi became second Daimyô of Ogi and built a fortified house ( jin'ya ) to be the domain headquarters in what is now the city of Ogi. The 2nd son of Nagai Naokatsu, who had served Tokugawa Nobuyasu then his father Ieyasu. He held Yamashiro Nagaoka, Yamashiro 10 000 koku 1633 - 1649 and then moved to a new Nagai feeder han Takatsuki, Settsu 36 000 koku 1649 - 1671. His son, Nagai Naoyoshi 1617 - 1669 永井直吉, pre-deceased him so the han passed to Naoyoshi's son - Naotoki 1631 - 1680 永井直時. The han remained in this line of the family till 1871. The eldest son of Nagai Naokatsu. He fought at both Sekigahara and Ôsaka, during the Shimabara rebellion he was assigned the defence of Kyoto. He was Rôjû from 1622 – 1633. As a Daimyô, and representing the Nagai Senior Line, he held Uruido-han, Kazusa 15 - 24 000 koku 1619 – 1626, Koga-han, Shimôsa 72 000 koku 1626 – 1633, and Yodo-han, Yamashiro 100 000 1633 – 1658. He then retired and became a monk. He was followed, as Daimyô, by his son Nagai Naoyuki (1614 - 1673) who held Yodo for another 11 years before being moved. Masanaga was the son of Naitô Ienaga and served the Tokugawa. He saw service in both the Sekigahara and Ôsaka campaigns. He received Sanuki, Kazusa, in 1600 with a revenue of 20 000 koku and held it till 1622. 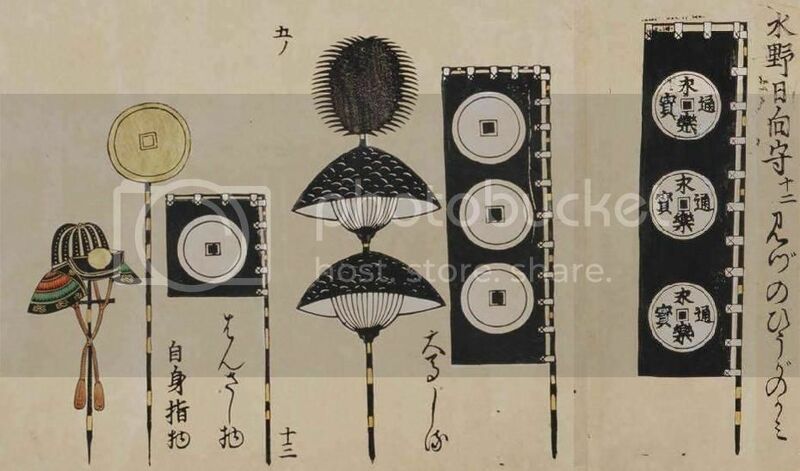 He then moved to Iwakidaira, Mutsu 70 000 koku, which he held 1622 - 1634. He was followed by his eldest son Naitô Tadaoki (1592 - 1674) and the han stayed in the family line till 1747 when they were moved to Nobeoka, Hyûga on a much reduced income. Nobunari was the son of Matsudaira Hirotada and the adopted son of Naitô Kiyonaga, so adoptive brother to Naitô Ienaga. Tokugawa Ieyasu was his step-brother and he served Ieyasu as a page, he then was involved in the 1656 fight against the Mikawa monto and fought at Mikatagahara in 1573 and in the fight against the Hôjô in 1590. He was rewarded with a castle at Nirayama, Izu 10 000 koku. 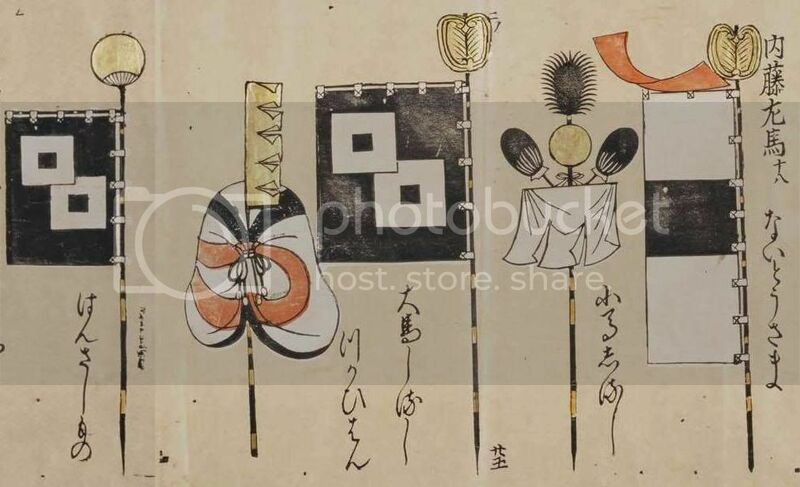 In 1601 he received Sunpu, Suruga 40 000 koku which he held till 1606, then moved to Takatsuki, Settsu 40 000 koku 1606 - 1612. He was followed by his eldest son Naitô Nobumasa 1568 - 1626 who would hold a few fiefs till his death and all for short durations. The second son of Nakagawa Kiyohide 1542 - 1583,who died at Shizugatake, his elder brother (Nakagawa Hidemasa 1568 - 1592)died during the Imjin War. Hidenari led 2500 men in the Imjin War under Todo Takatora and afterwards drifted into the Tokugawa camp, supporting them in the Sekigahara campaign by attacking Usuki Castle. He held the Oka or Takeda-han in Bungo rated at 70 000 koku from 1594 - 1612. He was followed by his son Nakagawa Hisamori 1594 - 1653. The family held the fief till 1871. Toshinao was the son of Nanbu Nobunao and supported Tokugawa Ieyasu for the Sekigahara campaign. He worked with Date Masamune and Mogami Yoshiaki in the north against the Uesugi. At Ôsaka in 1615 he held position across from the Sanada maru near the Hiranogawa. As part of the Nanbu senior line he held Morioka, Mutsu 100 000 koku 1599 - 1632. He was followed by his 3rd son Nanbu Shigenao 1606 - 1664. The family line held the fief till 1871. 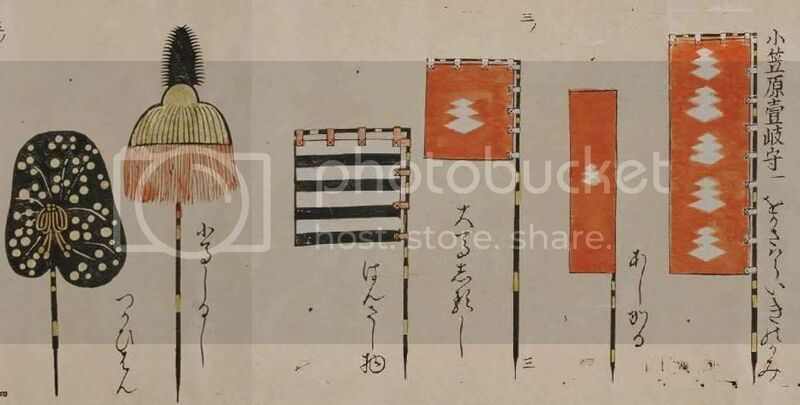 In later years the family would also have two satellite domains - Hachinohe, Mutsu 20 000 koku 1664 - 1871 and Shichinohe, Mutsu 11 000 koku 1819 - 1871. His eldest son, Niwa Mitsushige 1622 - 1701, would follow him, eventually receiving Nihonmatsu, Mutsu which they would hold till 1871. The first of the Three Unifiers. The son of Oda Nobuhide 1510 - 1551. There is so much available on Nobunaga I will not re-iterate it all here, if you go to the main forum index there are quite a few threads on Nobunaga well worth following. Nobunori was the son of Oda Nobukane 1543 - 1614 who was Oda Nobunaga's younger brother. 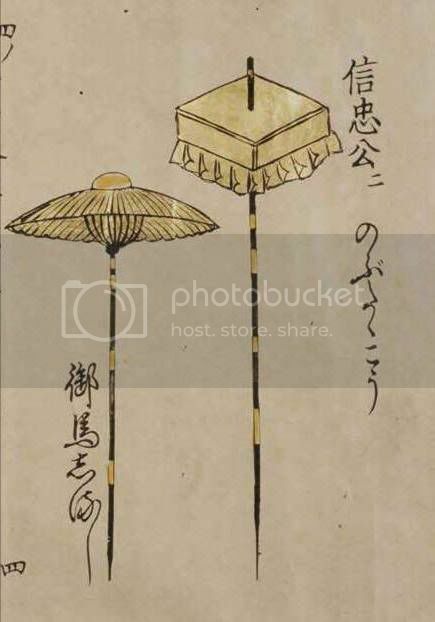 In 1598 Nobukane became Daimyo of Kaibara, Tamba a 36 000 koku han, he held this till his death in 1614. Nobunori then succeeded him and held the han till 1630. He was followed by his eldest son Oda Nobukatsu (1523 - 1650) who held the han till 1650. From 1650 till 1695 the han was under Shogunate control, in 1695 it came back under the Oda till 1871. Also known as Oda Nobushige, Nobutada was Nobunaga's eldest son (although there are theories there was an older one) and heir. 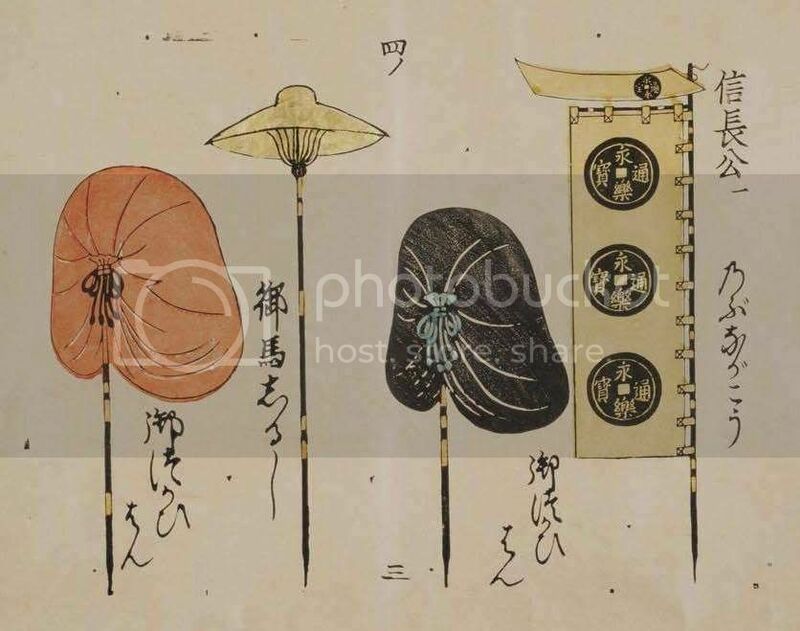 He fought many battles on his father's behalf against the Matsunaga and Takeda to name a few and was considered a promising, well-liked commander. At the time of his father's death he was at Nijo castle in Kyoto and when besieged by the Akechi he also committed suicide. Of his two sons, Oda Hidenobu 1580 - 1605 and Oda Hidenori 1581 - 1625, neither would hold a domain after 1600. Banners Left – right. Both are O uma-jirushi. Nobutaka was the 3rd son of Nobunaga and was also known as Oda San Shichi. He married the daughter of and was adopted by Kanbe Tomomori. He was preparing an invasion of Shikoku when his father died. He joined Toyotomi Hideyoshi in putting down the Akechi at Yamazaki. After he received the support of the Shibata and Takigawa to assume control of the family which put him on collision course with Hideyoshi. Whilst the Shibata were held by the weather, Hideyoshi destroyed both Nobutaka and Takigawa Kazumasa piecemeal. After surrendering he was sent to the Daimidoji in Owari and here he committed suicide. It is possible he had a son called Kanbe Nobushige (no other details). The 4th or 5th son of Oda Nobuo, who was Nobunaga's 2nd son. 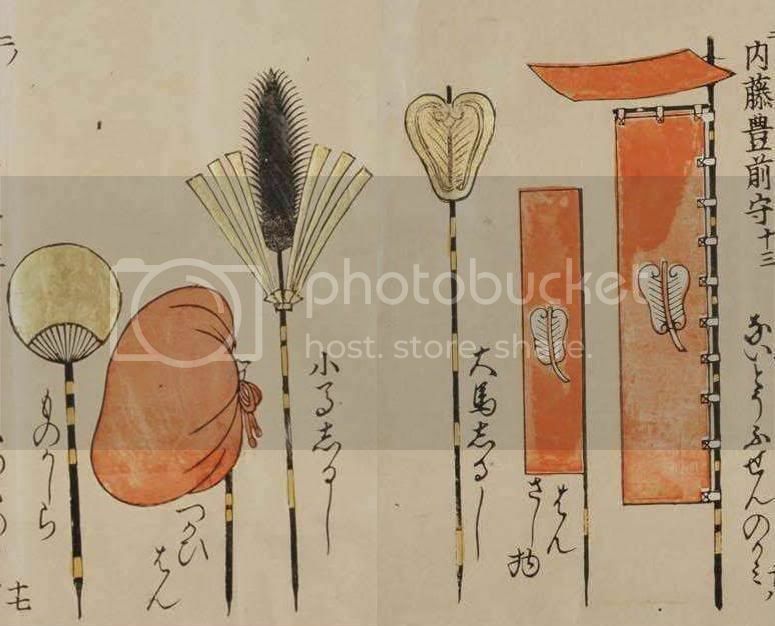 Nobuo / Nobukatsu 織田信雄 / 織田信勝 1558 - 1630, had been adopted by Kitabatake Tomofusa, and was also then known as Kitabatake Nobuoki 北畠信意. He supported the Tokugawa at Osaka and received Uda-Matsuyama, Yamato 28 000 koku which he held till his death in 1630. Takanaga then followed his father as Daimyo and held the han till 1659, he was followed by his 2nd son Oda Nagayori 1620 - 1689. In 1695 the holder (Oda Nobuyasu) moved to Kaibara, Tamba (which till 1630 had been held by Oda of Nobukane's line (see 119 Oda Nobunori). The son of Ogasawara Sadayoshi 1546 - 1595. Hidemasa was killed at Ôsaka. So the family had returned to their old home. 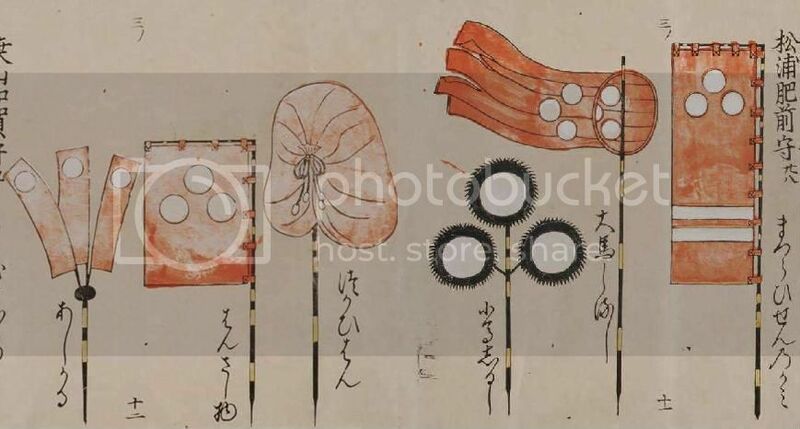 His sons were Tadazane 1596 - 1667 who in 1617 moved to Akashi, Harima 100 000 koku, then to Kokura, Buzen 150 000 koku, a fief they would hold till 1871. Hidemasa's other son Matsudaira (Ogasawara) Shigenao 1601 - 1643 was adopted into the Matsudaira (Nomi) family and was a Daimyo himself. 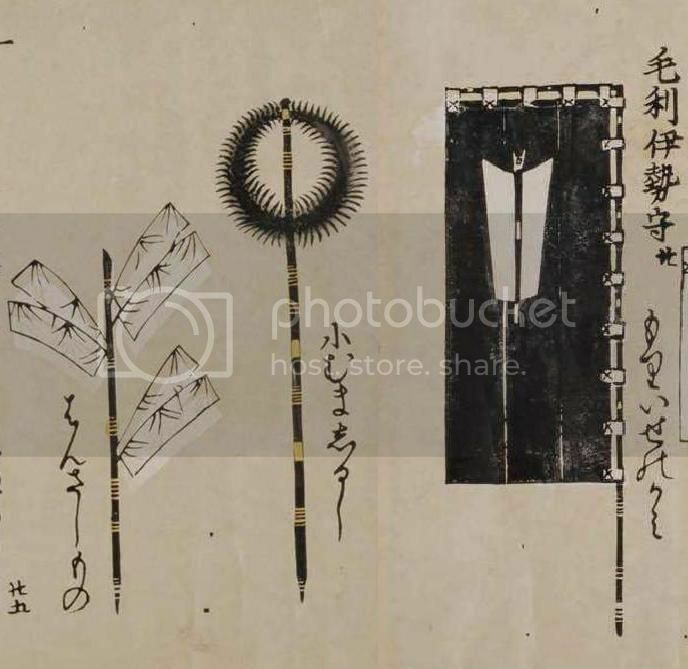 His 3rd son Ogasawara Tadatomo 小笠原忠知 1599 - 1663 had a hatamoto holding but became a Daimyô in 1632 when he held the Kitsuki, Bungo fief - moving in 1645 to Yoshida, Mikawa 45 000 koku. 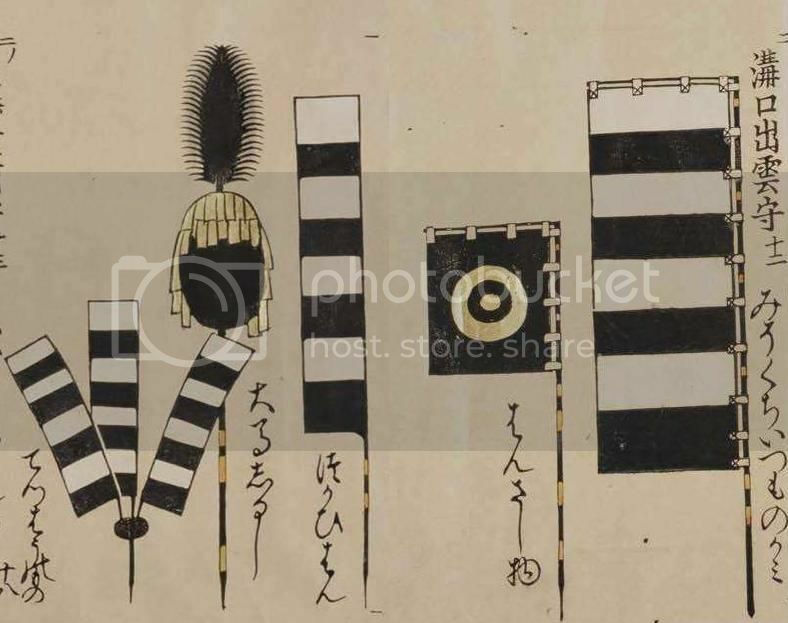 Nagatoki was the son of Ogasawara Nagamune 小笠原長棟 1492 - 1542 and the father of Ogasawara Sadayoshi 1546 - 1595 小笠原貞慶 and hence the grandfather of Hidemasa. He was a warlord in Shinano, holding the Fuskashi area, during the Takeda expansion and allied himself with his neighbours, the Kiso, Suwa and Murakami. They fought at Sezawa and lost, Nagatoki then allied himself with Uesugi Kenshin but all his subsequent fights with Shingen he lost and he eventually gave up and retired to Kyoto where he taught horsemanship and archery. He was murdered in 1583.